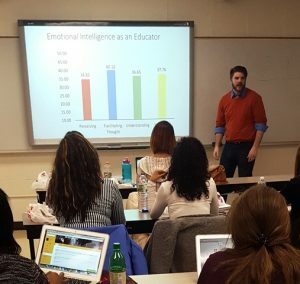 The Fordham GSE Division of Curriculum and Teaching is collaborating with the Yale Center for Emotional Intelligence on a series of workshops for the Early Childhood Special Education M.S.E. program. Craig S. Bailey, Ph.D., Director of RULER for Early Childhood and Associate Research Scientist at Yale Center, is teaching techniques from the RULER approach to support social emotional learning and emotional intelligence.